When my Cousin Simon and his Wife Sarah were in town one time, Sarah mentioned how she had been making homemade granola bars. She was telling me about all of the different recipes she was trying. We weren’t buying that many granola bars at the time, but I kept my eyes open for a good recipe. This Blog posted a recipe that looked pretty tasty to me, and I happened to have all of the ingredients so I gave it a shot. I thought they turned out really really well. Next time I make them, I will make a few adjustments, but those are because of personal preference not because I didn’t think the original recipe wasn’t good. If I had kids, I would definitely make these one a regular basis to put in lunches or for snacks. I started with straight applesauce since I didn’t want to mess with those pouches, but I am sure a flavored applesauce would be really good too. I mixed in honey, nothing wrong with agave nectar I just didn’t have any. The recipe calls for Wheat germ and I didn’t have any. I used flax seed flour. I think wheat germ would have made it taste better, but this is a personal preference thing. The flax seed flour is really really low carbs, so if you are worried about that, this might be for you. Then you add the oats. Then the sunflower seeds or another seed if you prefer something else. The chopped pecans come next, I didn’t really chop mine much because they tend to get broken in the mixer so I didn’t waste my time. Then the recipe calls for craisins, I added them because I had them, but I prefer things like this sweeter rather than tart so next time I would use dried cherries. Grant liked the granola bars, but wasn’t a fan of the craisins in them. Take a 8×8 dish and line it with parchment paper. Add all of the filling and press firmly, you don’t really want air holes. I left the parchment paper longer so it was easier to remove later and because I didn’t want to take the time to cut it. Thanks to the parchment paper, they are super easy to remove from the dish. Slowly pull down on the parchment paper and then let them cool. Slice them up and enjoy. I ate a ton of them and really liked them with my lunch. Whisk together pouches and honey in a large bowl. 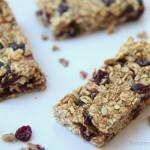 Combine with oats, nuts, wheat germ and cranberries. Line 8 x 8 pan with parchment paper and pour mix into pan. Bake at 325F for 25 minutes. Allow to cool for one hour then remove from pan and cut into bars. Makes 12 bars.